Defensive transition stops or slows down the opposition's fast break, and is one of the most important concepts for a successful team. 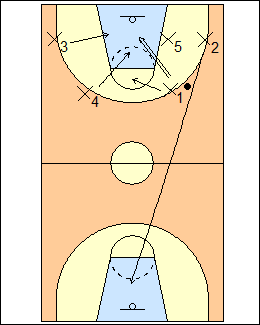 - 3-4-5 form a triangle on the boards, trying for an offensive rebound or a tip back to 1. - 1 is the dog on the ballhandler. 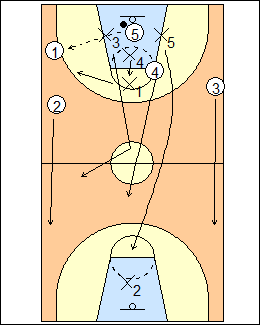 AIS defensive transition - 4 is the plugger, 3 takes a second pass upcourt. Tall Ferns transition - the closest man to the defensive rebounder is the plugger, the other two offensive rebounders are sprinters, the first one back releases the safety, the second one matches up shading weakside, the safety denies a ballside pass once released. See Defences - AIS defensive transition, Tall Ferns transition, Defensive transition. If the ball is thrown back to the rebounder, plugger 4 becomes the dog, 1 becomes the plugger. 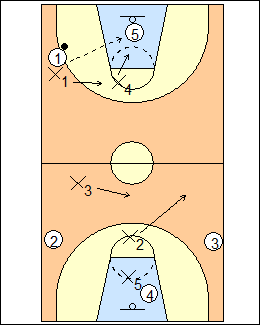 On ball reversal, 2 denies a pass up the other sideline and 3 gets to the split line (at about halfcourt). If the ball gets advanced all players behind the ball must sprint to get below the line of ball.